A quarter century after the ouster of dictator Ferdinand Marcos, the government will officially hold accountable his martial law regime for human rights abuses and its victims compensated for their sufferings. A bicameral conference committee will hold a final meeting Monday to smooth out the final version of a bill that seeks to compensate victims of abuses during the 14 years martial law was enforced before it is submitted for approval by the House of Representatives and the Senate, Albay Rep. Edcel Lagman said Sunday. Compensation will come from the P10 billion of the Marcoses’ ill-gotten wealth that Swiss authorities have transferred to the Philippines. The amount that each would receive would depend on what kind of abuse they suffered. Aside from that, the impending law would hold Marcos responsible for what transpired during his dictatorship. “Finally, over two decades after the fall of the dictatorship, we will have a law that puts the responsibility for human rights abuses square on the shoulder of Marcos and provides justice for all those who suffered under his reign,” Akbayan Rep. Walden Bello said in a statement. Bello, a member of the bicameral panel, also said the bill would ensure that the younger generation would learn about the atrocities committed during martial law. It is important to impart the lessons from the Marcos regime to prevent a repeat of the dark period, he said. “The nation is practically on the verge of forgetting the atrocities committed during the martial law period, and this is not by accident but because of the deliberate revisionist efforts of the Marcos camp to whitewash the memory of that period. Justice also lies in ensuring that Filipinos of all generations will not forget the dark, violent past, and the bill ensures that,” he said. Samahan ng mga Ex-Detainee Laban sa Detensyon at Aresto (Selda), for its part, said the bill was all the more significant for formally recognizing that abuses were committed during martial law and that there were those who did not take these sitting down. “More than the monetary compensation, the bill represents the only formal, written document that martial law violated the human rights of Filipinos and that there were courageous people who fought the dictatorship,” the group said in a statement. “We salute the Martial Law heroes who, despite old age, sickness, maneuvers of the Marcoses, and all other obstacles along the way, have painstakingly stood and fought to make sure that this bill granting reparation and recognition to the martial law victims is passed. We have gone a long way. We have long fought for this,” said Marie Hilao-Enriquez, SELDA chairperson and a Martial Law victim herself. Yesterday, the bicameral conference committee hammered out the final version of the Human Rights Victims Reparation and Recognition Act of 2013, formerly known as the Marcos victims compensation bill, provisions of which became acceptable to the majority of the victims as the final version now included SELDA’s position. “In welcoming the final version, we remember the SELDA leaders who pursued the path of making the Marcoses accountable for the human rights violations they committed to the hundreds of thousands of Filipinos who fought martial law,” said Enriqiuez. SELDA remembers and salutes the bravery and memories of Don Chino Roces, founding chairperson of SELDA, Dean Armando Malay, Dr. Nemesio Prudente, former Navy Capt. Danilo Vizmanos, Atty. Jose Mari Velez and Atty. Rolando Olalia. They were members of the Board of SELDA who decided to go after Marcos after the dictator’s downfall. The group also commended the steadfastness of SELDA Board members who are still living, like Fidel Agcaoili, Juliet De Lima-Sison, Vicente Ladlad , Dean Francisco Nemenzo, Tita Lubi, Josephine Dongail and Doris Baffrey, Board members who are still alive. “We share this victory to Atty. Romeo Capulong who took over as SELDA’s legal counsel when Atty. Jose Mari Velez died in 1991. He tirelessly assisted the victims and SELDA in the twists and turns of the case. He exerted all efforts against the maneuverings of the Marcoses and the machinations of the American and other Filipino lawyers in the case. We also dedicate this bill to all the heroes and martyrs of Martial Law who have gone before us, and who waged the most determined fight against the dictatorship and suffered the worst violations during martial law,” Enriquez stressed. Enriquez added that this bill is a small effort of SELDA to ensure that their sacrifice shall not be put to waste. SELDA’s position on the “conclusive presumption” provision was among the positive provisions included in the final version of the bill. This provision states that the 9,539 victims who filed and won the historic class suit of Martial Law victims against the Marcoses filed in 1986 in Hawaii are automatically recognized as victims of human rights violations. 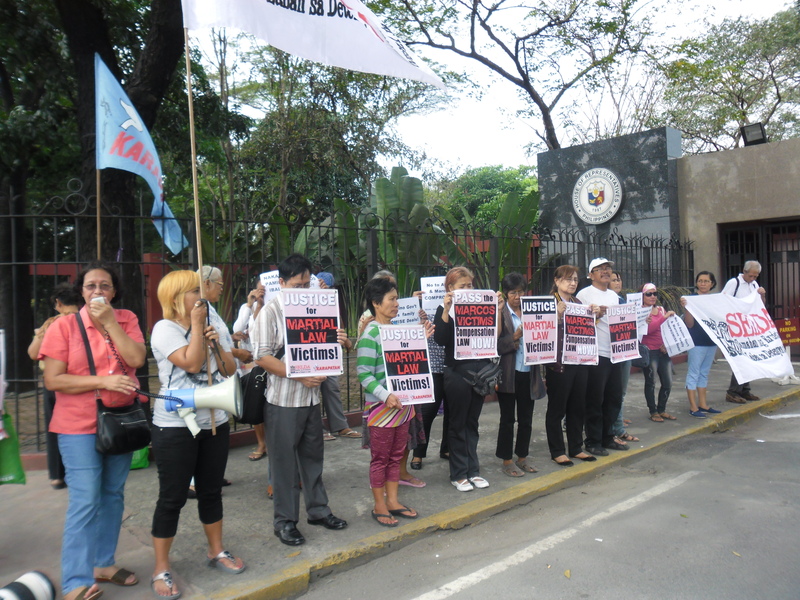 “The bill’s passage is a victory not only for the victims but for the Filipino people. More than the monetary compensation, the bill represents the only formal, written document that martial law violated the human rights of Filipinos and that there were courageous people who fought the dictatorship. Hundreds of Martial Law victims from Central Luzon and Manila gathered at the Senate grounds today while the bicameral conference committee deliberates the Marcos victims’ compensation bill for the third time. 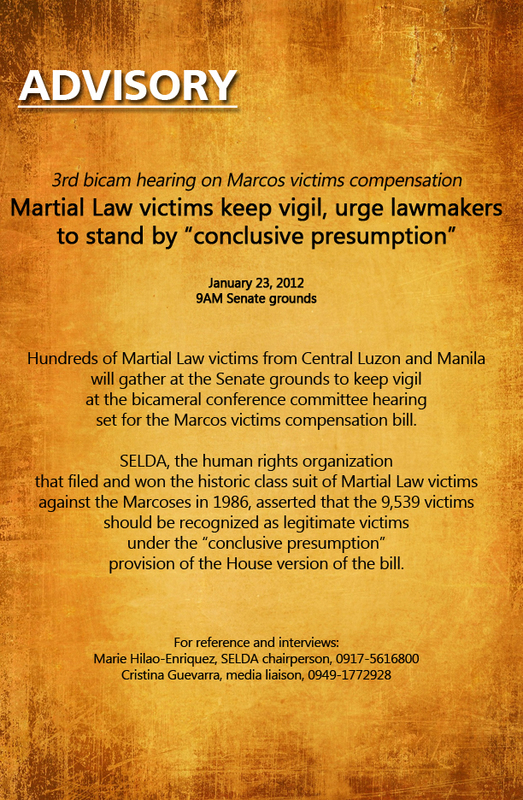 The ‘conclusive presumption’ provision recognizes that the 9,539 victims, including the 24 direct action plaintiffs who filed and won the historic class suit of Martial Law victims against the Marcoses in 1986 are legitimate HRV victims that must be automatically considered as such under the proposed Philippine law. “They have gone through the tedious process of proving that they are victims under a competent court and must not be made to go through a grueling process again of relating their sufferings under the law; they have done so in the Hawaii court already. Enriquez added that the ‘conclusive presumption’ provision shall also encourage other victims who were not part of the class suit to come forward. Fears that fake claimants may take the place of genuine victims should not be the case, according the group, because the bill has a number of mechanisms to prove this. One of the safeguards would be to involve the organizations of victims and other organizations that documented and assisted the victims in their struggle for justice. These are SELDA, FIND, TFD and some lawyer organizations that helped in the legal cases of the victims.